May is here and the water temperature at the Surf City Pier is finally 68 degrees. That is usually my magic number to go fishing. There have been no signs of Chopper Blues since April 21, when one was caught at one of the other piers. There are a couple of Black Drum in the surf. Mullets are here on and off and can be caught at the pier. I have found flounder in the sound, but most are too small to stab. There are blues to be had at the end of the pier once in a while. There has been a steady 10MPH southward wind since about May 4, and it isn’t stopping any time soon. In fact, the forecast shows this same steady wind going well past May 15. I have a friend up at Atlantic Beach who caught 4 chopper blues today, most being in the 8 – 10 lb range. At Soundside Park there are a couple of blues once in a while and some shark. I caught a 3′ long shark there today. I don’t know what kind of shark it was but it had “cat’s eyes”. At least it put up a fight and kept me interested. I did see a pole almost go over the side- but it was a hit and run. Not sure what kind of fish it was. If the fishing picks up here I will update this post. 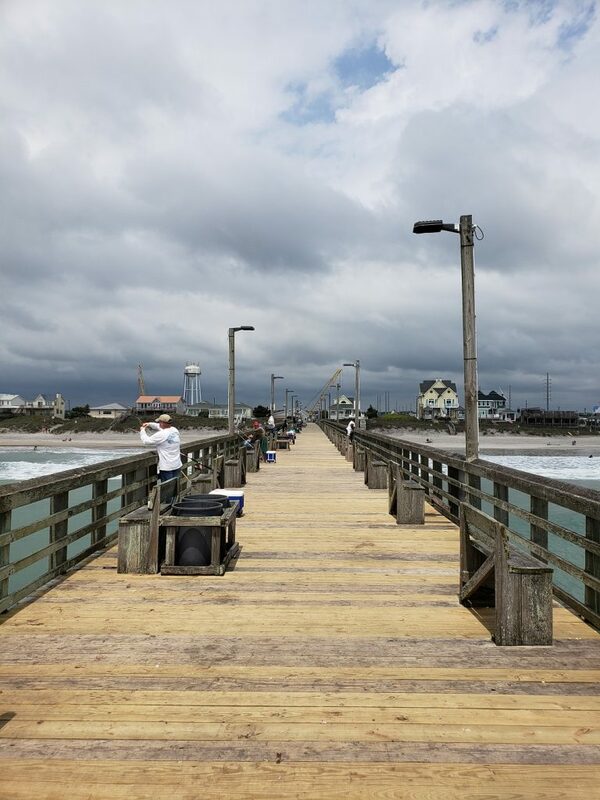 Be sure to check the Topsail Island Fishing Report in June. I’ll be updating it regularly.